Despite the naysaying and doom laden predictions coming from the left of the labour movement, David Miliband’s leadership of the Labour Party started off well. From the moment he emerged ashened face from behind the curtain at party conference, he set out a stall that confounded expectations. Labelled as the continuity Blair candidate, David’s victory speech – secured across all three sections of the electoral college, albeit very narrowly with a higher-than-expected turnout from USDAW members in the trade union component, emphasised the need to capture economic credibility. He announced an establishment of a commission under Alastair Darling to revisit the rules and responsibility attached to government spending, but he also played to the left by indulging tough rhetoric around the regulation of the entire economy. The behaviour and spending of public bodies wouldn’t be the only ones to be covered by tough new rules: businesses big and small were also expected to behave responsibly and play their part. Concerned to yank back economic credibility from the Tories, he reaffirmed the Darling plan to halve the deficit over the course of the parliament, and made points around the need to develop a proper industrial strategy. Lastly, David Miliband announced an ambitious plan to re-energise and refound Labour as a mass organisation, offering CLPs incentives to recruit people and draw more trade unionists into the party. Jon Cruddas was also announced as the face of the Movement for Change. Shadow cabinet elections came and went. As Darling had ruled himself out from heading up a front bench position, the shadow chancellorship went to John Denham. Angela Eagle was sent to BIS, in an unexpected comeback Ed Miliband got the shadow foreign brief, Yvette Cooper the home office, Jim Murphy defence, Alan Johnson education, and Andy Burnham health. Observers noted that Ed Balls was kept from the top team, getting the Transport brief. During the first year of opposition, the David-led Labour Party played the Westminster game well. He proved, at times, an effective interlocutor at Prime Minister’s Questions, though more often than not the clashes ended with a score draw. Labour also supported the air strikes in Libya, leading some – mainly on the left – criticising Miliband for appearing to have too warm a relationship with David Cameron. Questions were also raised that summer when a scandal broke about phone hacking. It transpired that News of the World journalists were hacking voicemails and using the information to run stories. The public and Westminster were largely unconcerned until it was found the phone of murdered schoolgirl, Milly Dowler, had been tampered with, which gave her parents hope that she may have been alive. An almighty storm brewed up and Rupert Murdoch was forced to close his Sunday paper to prevent the toxicity spreading to the rest of his publishing empire. However, while condemning the appalling practices that had been uncovered, David Miliband did not launch his own generalised critique of the press – instead much of the legwork was left to people marginalised under the new regime, such as Tom Watson. Nevertheless, a successful party conference in Liverpool came and went – crowned by a speech applauded from all sides of the commentariat for setting out a vision of a Greater Britain, in which all were to benefit from a rising tide of prosperity once the forces of conservatism had been pushed aside. It was bitter sweet from a left point of view. He made supportive comments around the living wage, and challenged Labour-run councils to implement it. Though, again, there were grumbles and a few relatively low-level protests around cuts to local services – councils were expected to get on with the business of passing on Tory cuts themselves. 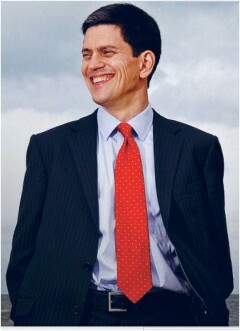 Yet the opinion polls ticked upwards, and David Miliband’s personal ratings hovered in close proximity to the PM’s. Then came the darkest moment for the government and the brightest for Labour. George Osborne’s omnishambles budget saw him ease up on austerity and commit the government to the Darling plan, something Miliband jumped on with alacrity. In his budget response he demolished Osborne’s austerity policies. In one fell swoop the Tories had renounced their economic credibility by retreating to the surer ground of Labour’s plan. However, just as the path to the home counties opened up, so the cracks started appearing in David’s leadership. It began almost imperceptibly. At a stunt following the announcement of the pasty tax, the leader along with several shadcab colleagues piled into a Gregg’s for a photo opp and a round of sausage rolls and pasties were duly ordered. All tucked in outside, save David, who on the way to his car was snapped dropping his into a bin. A small thing that would later assume greater significance. Following George Galloway’s win in the Bradford West by-election, a number of union leaders and left MPs wrote an open letter to the leader’s office asking for a policy review, and urging the adoption of an agenda they argued would tackle the ‘cost of living crisis’. Unfortunately, it fell on deaf ears. David had also refrained from criticising bankers’ pay outs at the start of the year, despite his previous calls for responsibility in business. Amid the poll leads, that for three months consistently topped 12 points, Team David thought they were on the road to Downing Street. After all, while Bradford West could be put down to a one-off, Labour was able to win Corby with ease after Louise Mensch stepped down from the House. 2013, however, was not a kind year to Labour at all. From April the government’s change to housing benefit – the introduction of what came to be known as the bedroom tax – came into force. Constituency offices had a surge in cases from people affected by this punishing attack on the most poor and vulnerable. Unfortunately, not wanting to risk being seen as weak on social security, David Miliband criticised its implementation, dwelling on the fact there was not enough social housing for those hit by the change to move into. However, he refused to reverse the policy saying it, along with a number of changes the government had made, might be subject to a review after the election. This stoked up a row with the big trade unions, leading to an unseemly war of words in the pages of The Guardian and New Statesman. Matters weren’t helped when Unite were accused of trying to rig a selection in Falkirk. However, this was followed by a much bigger crisis – the largest of David Miliband’s leadership. In August, Parliament was recalled to discuss the murder of dozens of children in a chemical attack in Syria. Intelligence pointed to Assad’s forces being responsible, though it was not one hundred per cent conclusive. David Cameron tabled a motion seeking the House’s permission to join American military action, which the Labour leader backed. This was followed by the resignation of a number of junior shadow cabinet people, and defiance of the party whip by some 80 MPs. A large street movement developed, albeit not quite in the same proportions the Iraq War mobilised 10 years earlier. Nevertheless, it was profoundly damaging. George Galloway’s Respect Party had a second lease of life, and the Greens and UKIP also pushed themselves forward as vocal opponents of the war. As for the fortunes of the conflict, systematic pounding of government positions enabled the Islamist militias on the ground. The civil war stalemate was broken and rebel forces poured into Damascus, with Assad and his closest allies barely escaping by a diplomatic jet provided by Russia. Immediately, the militias started fighting among themselves. The largest and most powerful, ISIS, was eventually able to win out but soon moved against the Kurds in the north and began incursions into western and northern Iraq. At the time of writing, some 200,000 people lie dead and most of Syria and chunks of Iraq are in the grip of Islamist terror. Again, the United States and Britain have been forced into turning against a monster of their making. Labour’s share in the polls started to slide. The war was unpopular, and Labour strategists were confounded by its diminutive effect on Tory polling figures, while biting into our party’s shares. The Greens especially benefited, reporting a membership surge on account of their anti-war stance and positioning against the bedroom tax. By the time conference season came around, there was very little he could say to assuage members’ anger. Nevertheless, he did retain the active support of enough to prevent an existential crisis to his leadership. After a lacklustre speech about the need to create a stakeholding meritocracy, he made a quiet approach to the unions for a Warwick-style agreement – this was due to be a very public making up, and was scheduled for the new year. This, however, was overshadowed by two events. The sad passing of Paul Goggins triggered a by-election in Wythenshawe and Sale East in February. Labour kept the seat with ease, but the rise of UKIP and the Greens the previous year saw them both turn in very creditible performances of 18% and 11% respectively. Commentators were quick to note these sorts of protests against the opposition didn’t bode well for the general election. The second was the surfacing of a video, published by the Guido Fawkes blog, of David Miliband at a private fundraising dinner for business. Asked about the future of trade unions, he replied “Do they even have one?“. The result was absolutely devastating. There were mass resignations and the war of words with Unite dragged in the rest of the trade union movement. Even USDAW and Community chimed in with a joint statement by Labour affiliates. Warwick mk III never happened, and Unite, Unison, and the GMB pledged to support only those Labour candidates who professed trade union values. The Tories, having looked for an angle to hit back at Miliband, linked his union comments, the pasty incident, and Westminster tittle-tattle about his alleged arrogance and indifference to more junior members as evidence of elitism and snobbery. Caricatures of David as Lord Snooty started appearing in the press, and stories circulated of divaesque behaviour that put Liam Byrne’s ‘Working with Liam Byrne‘ document in the shade. Somehow, despite the awful pressure of Tory attacks and party crisis, David was able to present the same smooth, confidence to the camera. Even the panic that gripped Westminster in the closing days of August over the independence referendum seemed not to disturb his preternatural calm. The Better Together campaign had long since been licensed out to Alistair Darling. He and other Labour MPs were sharing platforms and media pitches with the Tories in defence of the union, and David himself went on telly jointly with David Cameron to appeal for a no vote and warn of dire consequences should Scotland secede, particularly with regard to pension funds and use of the pound. In the end, Project Fear worked and independence was rejected 55-45. However, much to Labour’s dismay their polling figures collapsed, a problem that was exacerbated after Johann Lamont, the incumbent Scottish leader, resigned arguing that not only was she fed up being treated like the head of a branch office, but also attacked an unwillingness to offer the kinds of Labour policies the SNP were making a show of appropriating. As 2015 came round, the polls were tight. Wipe out was predicted in Scotland and a close race was forecast in England. On the plus side, despite all the difficulties of the previous two years, Labour ran the Tories almost neck and neck on economic competence and leadership qualities. Then, in the final two weeks of the campaign, the Tories started pushing hard the line that a lash up between the SNP and Labour were inevitable. The party that tried to break up the union would put Labour’s much trumpeted economic competence into jeopardy, so why take a chance? When it came to it, the result was all over the place. The SNP scooped up 56 out of 59 seats. The Blairist targeting of Middle England saw a healthy number of swing constituencies fall into Labour’s hands. This, however, was extremely uneven. The Tories’ own version of Project Fear in England managed to scare Tory leaning UKIP voters and some soft Labour votes in their direction, while Labour-leaning kippers kept to the purples. Meanwhile, on their left flank, the Greens polled extremely well off the back of their anti-war work, winning just shy of three million votes – a million less than UKIP. They came from the LibDems but, significantly, from Labour too. Virtually every gain was offset by a splintering of Labour’s working class and progressive support in a number of seats it really should have kept hold of. At the end of it, after a night none of us saw coming – though the warning signs were there – Labour had gone into reverse. Stalemate and Scotland gave us a net loss of 24 seats. Bewildered, angry, disappointed, David Miliband announced his resignation on the Friday and assumed full responsibility for Labour’s failure. That wasn’t his can to carry alone, but the controversial decisions and non-decisions he made left a number of people wondering what would have happened had the other Miliband brother won. Posted in: Activism, CLPD, Conservatives, Labour, Lib-Dems, SNP, UKIP. No mention of immigration? Too hard? Next time maybe? We would still have lost. DM was no answer, playing poodle to Hilary and the legacy of Iraq stalking him. the Millibands were 2 peas from the same pod. If Andy had bee elected then maybe we wold not have lost so badly. The Public simply didn’t trust Labour.